Valentines isn’t complete without dessert. Why not include an adult beverage along side of some chocolates? 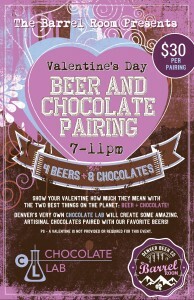 We’re partnering up with Denver Beer Company to create a unique pairing of truffles, chocolate covered bacon, candied pecans, and our pecan caramel bacon toffee along side locally crafted beers.